Nebuchadnezzar II reigned as king over the Babylonian Empire from 605-562 B.C. He was the son of Nabopolassar, founder of the Neo-Babylonian Empire in 625 B.C. Nebuchadnezzar plays a prominent role in the history of the Israelite people. He is mentioned numerous times in nine different Old Testament books. This monarch’s defeat of Pharaoh Neco at Carchemish (about sixty miles west of Haran [Gen. 11:31, 32]) in 605 B.C. established Chaldean supremacy in Syria and Palestine. Thereafter, the southern kingdom of Judah became subject to the new ruler. At this time, many of the Hebrew upper class were taken captive into Babylon. Daniel and Ezekiel were among these prisoners. Nebuchadnezzar again invaded Judah in 597 B.C. and took thousands more captive to Babylon, including king Jehoiachin (2 Kgs. 24:14, 15). This event has been strikingly confirmed by archaeological discoveries. In London’s British Museum, there is a baked clay tablet (just under three inches) inscribed in cuneiform writing (wedge-shaped characters) that records the activities of king Nebuchadnezzar between the years 605-594 B.C. In the entry which deals with the seventh year of the king (598-597 B.C. 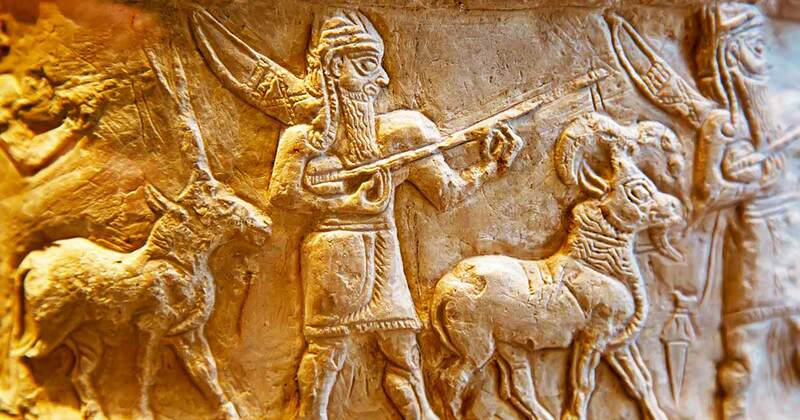 ), mention is made that in the month of Kislimu, the king of Akkad (Nebuchadnezzar) marched his army to Hatti-land (Syria-Palestine) and encamped against the capital city of Judah. On the second day of the month Addaru (15/16 March), he captured Jerusalem and its king. He appointed a new ruler (Zedekiah [cf. 2 Kgs. 24:17]) and took heavy tribute (cf. 2 Kgs. 24:13), which he sent to Babylon. Nebuchadnezzar’s record remarkably confirms the biblical record. Of further interest is the fact that this brick also has an Aramaic inscription of a man’s name — zbn'. The same name is found in Ezra 10:43 — Zebina (zbn'), a Hebrew who was among those who had married foreign wives in Babylon. There is no way of knowing if the name on the brick refers to the individual mentioned in Ezra. However, the name Za-bi-na-a' occurs on five other cuneiform sources. In one instance, the father and son of this person are designated Tobiah and Baaliah respectively. The ending of both of these names corresponds to the Hebrew — yahu, the divine component) of Yahwah, which clearly reveals that in this instance at least, Zabina was a Jew (see Mitchell 1988, 77). What Happened to the Ten “Lost” Tribes? Mitchell, T. C. 1988. The Bible in the British Museum. London, England: The British Museum.